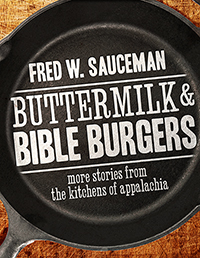 In his latest collection of writings about the foodways of the Appalachian region, Fred W. Sauceman guides readers through country kitchens and church fellowship halls, across pasture fields and into smokehouses, down rows of vegetable gardens at the peak of the season and alongside ponds resonant with the sounds of a summer night. The scenes and subjects are oftentimes uniquely personal, and they combine to tell a love story, a chronicle of one person’s affection for a region and its people, its products, and its places. Traversing Appalachia from an Italian kitchen in Pennsylvania to a soda shop in South Carolina, Buttermilk and Bible Burgers is a tribute to people loyal to the land and proud of their culinary heritage. Sauceman describes the common bond of breaking beans, the dignity of the barbecue pit, the nobility of the black-iron skillet, and the transformative power of a glass of Tennessee buttermilk. Sauceman also shares recipes from a teacher who lived to be 116. He explains Kentucky banana croquettes and Virginia Ju-Ju burgers. He samples trout caviar in the mountains of North Carolina and sorghum on the Cumberland Plateau in Tennessee. From a notebook stained by Nehi, Sauceman calls forth stories of Hungarian immigrants who gather every fall to make cabbage rolls in Virginia and Cubans who converge in Tennessee to roast a pig and to remember. BUTTERMILK AND BIBLE BURGERS is most of all an expression of gratitude for the persistence of the people who feed us. Sauceman's latest is a journey through deep into the heart of Appalachia with stories of iconic dishes and the people behind them in this folksy collection of vignettes and recipes. Opening with an eloquent tribute to his grandmother's comfort food with her recipe for stuffed bell peppers included, Sauceman's goal is to engender an appreciation for Appalachia's traditions and people along with the recipes and history of the region's food. There's the story of Big Bob Gibson, the man behind a mayonnaise-based barbecue sauce, the Clinchfield Senior Adult Center's addictive apple relish, and the curious evolution of the famous Sunburst Trout Farms, which started out as a mink farm and is now in the trout business. Other notable recipes include the Roanoke Hotel's classic peanut soup and the state of Alabama's beloved Lane cake. Sauceman thoughtfully includes contact information for each of the businesses or restaurants profiled, enabling curious readers to both seek out the best red-eye gravy or, if they so choose, buy the best cast-iron pan to cook it in. The result is a charming homage to Appalachian cuisine that manages to capture the both character of its people and their appetites.